2014 is the first year the Orange Section has recognized transportation planning, so San Clemente’s vision has, once again, made history: we’re the first ever in OC to receive the award. The panel of jurors complimented San Clemente with some pretty awesome language in their letter: “This Plan fulfills all of the criteria for this award: planning and innovation, compatibility, engagement, effectiveness and results . . . ” They called our vision for the future “exceptional.” The judges have also endorsed the Plan for consideration at the State of California award level. So stay tuned! As many of you know, I’ve long advocated for multimodal level of service as the key to efficient transportation networks (& the use of taxpayer dollars to fund them). But MMLOS is also key to transportation equity: we should all be able to safely get where we want to go based on our own freedom to choose the mode of travel that suits us best. Personally, I am not only honored with the APA’s recognition of our Mobility Plan, but also to have collaborated with San Clemente’s planners, engineers, consultants KTU+A, City Council, City Manager, General Plan Advisory Committee, and Planning Commission. Our Mobility Element was a (6-year) team effort extraordinaire, from concept to completion. To those who inspired us: thank you. To those we hope to inspire: dream big–there’s no such thing as can’t! San Clemente pushed past another obstacle to Complete Streets implementation last night when City Council voted 3:2 to repave and restripe Vaquero, a 56′ wide connector currently featuring a 12′ painted median residents had insisted provided a necessary refuge from speeding traffic which plagues their neighborhood. Vaquero, February 2014. Eliminating the painted median will slow motor traffic, and allow modern bike lanes and will actually facilitate driveway access. What’s not to love? The median was installed at resident pleading by a previous traffic engineer; rather than slow down speeding traffic it pushed motorists toward the right hand edge where a substandard bike lane forced cyclists into the travel lane at every parked car. The median was a “warm blanket” for residents who emotionally defended it at the meeting. Councilmen Chris Hamm and Jim Evert led the majority toward sanity with Mayor Tim Brown swinging the vote. We’ve more work to do convincing citizens and electeds that 99% motorist mode share does NOT mean 99% of the consideration must go to cars. That ain’t Complete Streets. Elimination of the median– which served primarily as a convenient place for residents to turn left into their driveways– allows for buffered bike lanes, narrowed travel lanes, and still allows plenty of on-street parking neighbors wanted. Left turn pockets at critical intersections will remain in a final plan. San Clemente’s Planning Commission last night approved the most bicycle friendly highway design in Orange County. 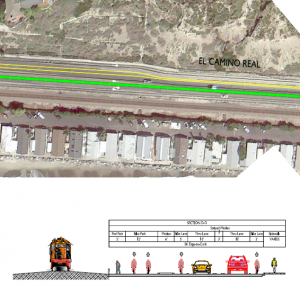 Cross section of El Camino Real (PCH) in San Clemente shows, Metrolink train, pedestrian on Multi-use path, south- and north-bound bicyclists on Multi-use path, landscaped divider, south-bound cyclist in the Bike Lane, 10′ car lane, 3′ median, 10′ car lane, northbound cyclist in the Bike Lane, and pedestrian on the sidewalk. Complete Street, indeed! Old Hwy 101,a.k.a. Pacific Coast Highway, was turned over to the city by Caltrans after the I-5 freeway was built. Called El Camino Real, it has languished as a 4-lane, then 3-lane, and now down to to 2-lane arterial. Over the years it’s had bike lanes of various widths and sidewalks some places. But always motorists have treated it like a full speed alternative to the freeway. In a year or so that will end. A model Complete Street rebuilding will add a Class 1 Bike Way– that is, a multi-user paved path– to the ocean side of the road, and extend a sidewalk the full length on the inland side. The travel lanes, reduced to 10 feet in width, will slow motor traffic and Class 2 Bike Lanes from 5 to 8 feet wide will run both ways. The multi-use trail is essential because San Clemente’s popular Beach Trail attracts many times the pedestrian and casual bicycle traffic that was expected. And most of the thousands of users expect a similar amenity to connect to Dana Point. Runners, sight-seers, stroller pushers, beach cruisers, and family bikers all want a trail separated from motor traffic. The city expects high volumes on the new trail, especially on weekends, holidays, and busy summer afternoons. Class 2 Bike Lanes are intended to attract higher speed cyclists, singly or in peletons, which are the single largest non-motorized group on El Camino Real today. Funding was achieved through a combination of Federal and State monies and the design phase has take a year. The effort has been sheperded by the city’s Traffic Planning Manager, Tom Frank with copious input from Pedal’s Brenda Miller, and local bicycle advocates including OCBC Director, Pete van Nuys.